Patrick and Deirdre were set up on a blind date by their friends. A good friend of hers and fellow teacher at Alliance is dating Patrick's best friend from work. Two summers ago, Patrick was invited to attend the Football Hall of Fame induction dinner by his company and he needed a date. Her friend thought that she would be the perfect option. They have been together ever since for over two years. Their friends that set them up took them on a blind double date to Hartville Kitchen. Deirdre wanted to meet Patrick before they went to the Hall of Fame dinner together. Then, the Football Hall of Fame dinner was their first official date. It was amazing. They hit it off right away and had a great time eating steak together. Patrick convinced her that she should have a graduation/going away party. She had recently graduated with her masters in educational leadership and at the end of the school year would be moving to Indiana to be with Patrick. Patrick had accepted a promotion/transfer from his company's plant in Canton, Ohio to one of their plant's in Lebanon, Indiana. So she invited her closest family members and friends for the celebration. Everyone had arrived and her sister-in-law told her to welcome everyone to the party and thank them for coming before everyone sat down to eat. She gave her speech and then turned to Patrick to see if he wanted to say anything. He went into his proposal and got down on one knee. Turns out she was helping to plan her own engagement party. It was awesome. Her parents, his parents, her brothers and their wives and his sister were all in on the surprise. They were married July 22nd, 2017. The day started off by the bridal party getting ready in two separate villas at the Days Inn in Carrollton, Ohio. After getting ready photos and bridal party photos, we headed to the University of Mount Union in Alliance, Ohio, where Deirdre (and I) both studied. The ceremony took place in Mount Union's Chapel. After the ceremony, we took family formals outside the chapel and then headed over to the infamous Chapman Hall and the bridge for bridal party portraits, as well as portraits of the bride and groom together. After taking photos, we quickly headed over to Glamorgan Castle in Alliance, Ohio before the heavens unleased rain on us. From there, we headed to the reception location, Century Farms, in Carrollton, Ohio. 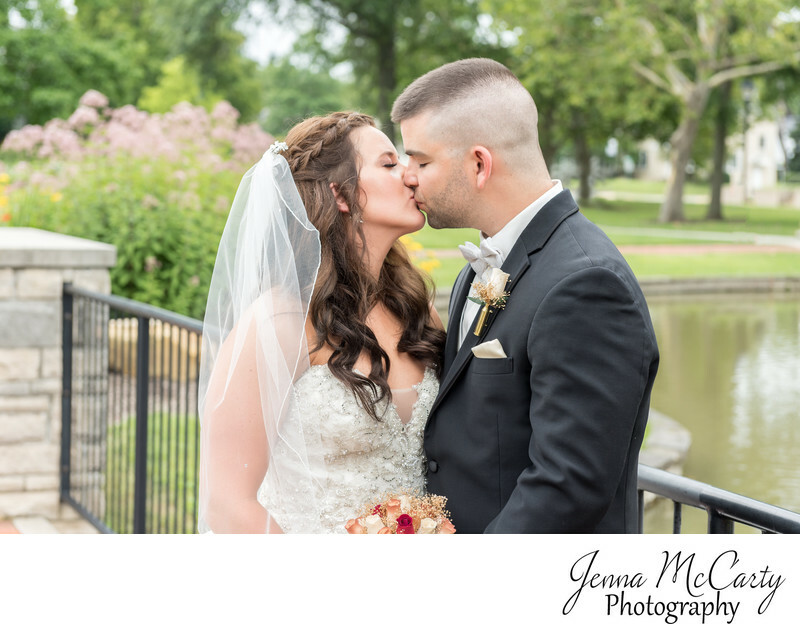 This photo features the bride and groom kissing on the famous bridge on the University of Mount Union's campus. Location: 1972 Clark Ave, Alliance, OH 44601.